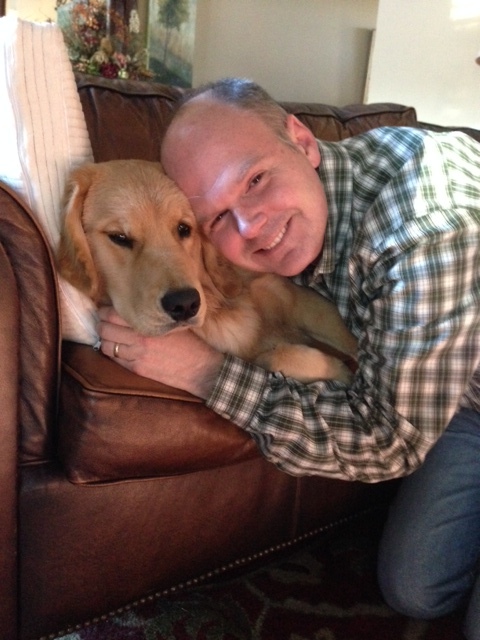 On August 1st, 2015 – our kids were “deceived” into driving out to East Texas to pick up a new family member, a Golden Retriever we named Sadie. That day was filled with joy, laughter, and love for this innocent animal. On September 27th, 2015 – I created a very rough draft blog titled “Sadie and Me.” It was intended to be whimsical look at the joys of a new puppy – the dog falling asleep on my chest and snoring, puppy breath, discovering life, bringing happiness, and not being able to stay mad at her when she ruined something because she was so darn cute. I also was going to write about the challenges of a new puppy – 2 am and 4 am wake up calls, EVERYTHING and everyone’s fingers becomes a chew toy, having more energy than everyone in the house combined, and how she would occasionally leave piles of “stuff” secretly throughout the household that I was magnetically attracted to and would step in. Unfortunately, on January 27th, 2016 – a fluke, cancerous tumor took the life of Sadie. That incident completely changed what I wanted to write about. 1.Sadie loved everyone. Most dogs have their “favorite” person in the house. Sadie was best friends with whoever would throw her the ball, chase her, or wrestle with her. She would greet us every morning with her slobbery kisses that instantly started our mornings off in a good mood. And she would cry with joy when each of us came home everyday from work and school. “A new commandment I give to you, that you love one another, even as I have loved you . . .” (John 13:34). 2. Sadie had unending curiosity. She was always “getting into stuff” – but it came from her inquisitive heart. She explored every inch of our backyard, taste-tested every piece of wooden furniture and also rocks, taste-tested any food she could reach on the counters, and victoriously disabled every stuffed animal she discovered in the kid’s closets. The first time Sadie encountered rain, she was leaping in our yard trying to catch each drop in her mouth. She knew the process that curiosity leads to trying something previously unexplored, which leads to new experiences, which lead to new knowledge. “If any of you lacks wisdom, let him ask of God, who gives to all generously and without reproach, and it will be given to him” (James 1:5). 3. Sadie loved to play hard. I already mentioned how she “danced” in the rain. She loved the rain so much, she would go outside and lay down in the yard during a storm. Dirt and mud were giant sandboxes to her, messiness wasn’t even an afterthought. “Fetch” quickly became “Keep Away” or “Tug of War” – the only time she would quit, was if she sensed us getting tired. Anytime we tried to catch her, she put on “football moves” that would be envied by any Heisman candidate. “Whatever you do, do your work heartily, as for the Lord rather than for men . . .” (Colossians 3:23). What am I investing my time, talents, and money towards? What type of legacy am I leaving during the day-to-day grind of things? Am I involved in a lifelong pursuit of something bigger than myself? It is amazing the things and life lessons we learn and from whom we learn them. I have always enjoyed listening to your Sunday school lessons and you always gave me things I needed to check in my own life. A pet is a member of the family and tugs at our heart the moment you see it. I look forward to your adventures with Sadie’s sister. It was good seeing you at church on Saturday. Love this. Can’t wait to see pics when you get your new puppy. Thanks for the reminders! Beautifully said!